Bold and beautiful, Lady Eleanor of Clarin--sole heir to her ancestral lands--chooses to marry an aging French noble rather than Edward I's choice of a brutal knight. To preserve Clarin and defeat the rebellious Scots who killed her father, she would gladly give her hand to the devil himself. 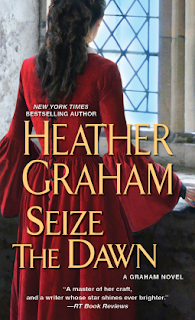 But when the fiery Highland outlaw Frendan Graham takes her hostage, he also inspires her deepest desires. Now, as Eleanor is swept away from her beloved land and into an arranged marriage, she will be surrounded by treachery and accused of murder. Only one man can rescue her from the torture and death that lie ahead. The man should remain her greatest enemy--yet holds her heart--and her very life--in his hands. Has been awhile since I read a historic romance, But I love Heather Graham´s book so I could not let it pass this chance to read and review her book. It didn't disappoint me, it was as good as I expected.